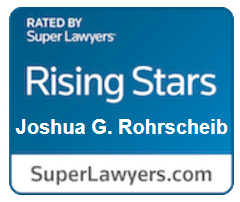 I was referred to Mr. Rohrscheib by another attorney regarding my personal injury case. His attention to detail and relentless perseverance helped win my case against a major insurance company. Josh gathered the facts on my automobile accident and kept me informed throughout the entire settlement process. After the case was settled he helped organize and pay all outstanding debts incurred as a result of the accident within a week of receiving the settlement proceeds. I am so grateful to this man. His passion is commendable and he is an outstanding attorney. Estate planning mission accomplished! That’s what Josh did for us, and did well. After a series of life changes, my wife and I realized we needed to update our wills. The attorney who’d done them last (20 years ago) had retired. We identified our new objectives and set off on what we thought would be a simple mission to revise the Wills. After one and a half years trying to work with three different attorneys (solo practitioner to large firm, young lawyer to old), we were unable to accomplish satisfactory revisions. Then I learned Josh had returned to central Illinois and private practice. He met with us and took the time to understand our circumstances and to research and get advice on everything he needed to properly address our situation and concerns. He proposed approach that better dealt with our circumstances. More importantly, he spent the time to work with us through drafts to get it done and done right. We were very satisfied with his work and, more importantly his attitude and approach, and would highly recommend him to help with your legal needs. I hired Josh to help me with a legal situation that impacted several different areas of my life. He sprung into action immediately, fully resolved the situation, and provided very helpful counsel. Josh was very responsive, candid, and a force of nature in helping me through this situation. I would highly recommend him to my family, friends, or any of you. I was planning a trip out of the country. I wanted to make sure my Will and Powers of Attorney were in order in case something bad should happen on my travels. Josh looked over everything and quickly provided me with polished revisions. He also took time to explain different aspects of the documents and when I should look into revising them in the future. I left on my trip confident and at peace that everything was settled. Thanks to him, my family will know my wishes, should I ever be in a situation where I can’t tell them myself. I had never worked with a lawyer before and I’m lucky to have found one who is honest and trustworthy. Compassion, honesty, intelligence, and approachability. Mr. Rohrscheib possesses these quilities and more. When I found myself in a difficult spot, I was fortunate to discover Mr. Rohrscheib. He gave it to me straight, which I really appreciated. But he also actually listened to me. If all attorneys were like Mr. Rohrscheib, they would enjoy a much better reputation. I hope to never need his services again, but if I do, I know that he is only a phone call away. Josh represented me in a fence dispute with my neighbor who claimed they owned a wedge of my property due to the law of adverse possession. After months of litigation, we were able to come to an agreement and avoid any lawsuit by opposing counsel. His communication skills are excellent. The client comes first in his eyes. He was so thorough in investigating this type of law and did everything he could to help me avoid court costs. He has a great personality and is very professional. I would highly recommend Josh.